Review: Director Paul Greengrass' "22 July"
Anders Behring Breivik probably thinks "22 July " is about him. He's the violent narcissist whose actions are at the heart of the film, but Breivik is really the enigma in its center. 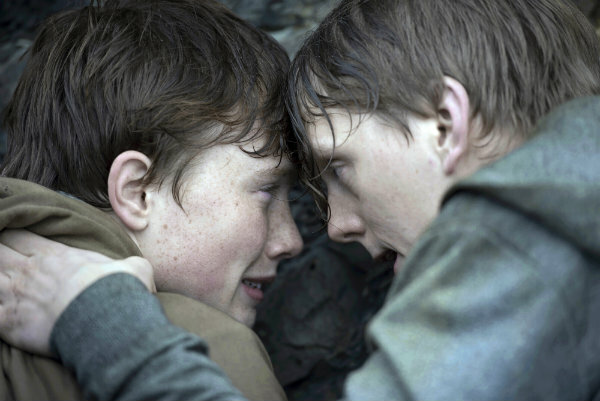 No, "22 July" is about everyone other than Breivik — and that is a remarkable cinematic feat. This powerful, must-see film — written and directed by Paul Greengrass — explores several of the lives altered when right-wing extremist Breivik went on a deadly rampage in Norway in 2011, killing 77. How this could this hatred happen in the heart of prosperous Scandinavia? That's the subtext. Greengrass is on the most slippery of slopes here — showing a mass murderer's violence without glorifying it and letting the gunman explain himself without feeding supremacist hatred. He threads the needle brilliantly. His film becomes more than the sum of its parts: It's a celebration of multiculturalism. Shot like a documentary, the first third of "22 July" lays out the horror of July 11, 2011, and the rest of the movie tracks how both a terribly wounded survivor, Viljar, (a stunning Jonas Strand Gravli ) and a lawyer for the gunman (a superb Jon Oigarden) struggle in its aftermath. Greengrass is known for employing a shaky cam and rapid-fire editing and those techniques are perfectly suited for examining this real, frightening moment. His other films dealing with real events include "Captain Phillips, "Bloody Sunday" and "United 93?," and Greengrass leaned on Norwegian actors and the book "One of Us" by Asne Seierstad to make "22 July." The writer-director shows real artistry in framing both the gunman (a frightening Anders Danielsen Lie) and his victims as opposites. The opening sequences show Breivik alone and silent, preparing his attack with icy precision. His soon-to-be victims at a summer camp, meanwhile, are laughing, hugging and clumsily putting up tents. Later, Greengrass will highlight the gunman's fate — a closed cell in artificial light — while the survivors are outside in twilight, the camera spinning 360-degreees to show the glorious Norwegian snowy landscape. On that fateful day, Breivik first set off a car bomb outside the government headquarters in Oslo, killing eight people and wounding dozens. He then drove to the island of Utoya, where he opened fire at a summer camp of the left-wing Labor Party's youth wing. Greengrass does not film these sequences moodily or evocatively. They are brutal and the fear is palpable. "Come out, you Marxists!" the gunman screams on his hunting spree. "I have started a war," he later announces. In the aftermath, we watch what Viljar goes through — multiple brain surgeries, a fake eye, relearning to walk. He wants to walk unassisted to the gunman's trial. He and his younger brother, who was also there, are coming to grips with the aftermath, and he's inspired by a nurturing fellow survivor, Lara (a wonderfully understated Seda Witt). "I can't live like this," Viljar wails. "It's all still here in my head." Oigarden plays Brevik's lawyer with an otherworldly calm. He clearly has no fondness for the murderer, but wants to offer his best defense possible, a noble higher calling. There are consequences — his family faces death threats, his marriage is strained and a nursery school tosses out his youngest. The rampage's aftereffects also are felt in the office of the prime minister, trying to see what went structurally wrong. The film, which has meandered a little since its explosive start, comes to a climax at Breivik's trial. Viljar's victim's impact statement is a brilliant aria about surviving violence and the power of life, and Lara, an immigrant herself, has her own powerful line: "I don't see what's so frightening about me." With tenderness and toughness, Greengrass has made a great film about a terrible act. "22 July," a Netflix release, is rated R, and contains horrific gun violence and graphic images of hospital surgeries. Running time: 144 minutes. Three and a half stars out of four.